The aim of Free the Bears Fund in Cambodia is to protect, preserve and enrich the lives of bears throughout the world. It’s therefore no wonder Free the Bears Fund decided to join the EAZA Pole to Pole Campaign last year. Teaching kids in Cambodia, a country where temperatures rarely drop below 30 degrees celcius and itself home to a number of threatened endemic species, to care about Polar species might seem like a tall order – however that is exactly what Free the Bears ACE (Awareness, Communication and Education) Team did recently. The annual Pchum Ben (Ancestors Day) festival is a time for Cambodian families to gather together and pay their respects to deceased family members by making offerings at temples. But how about using the festival to make some merit with future generations by ensuring that they inherit a world filled with all of the natural wonders that we enjoy today? 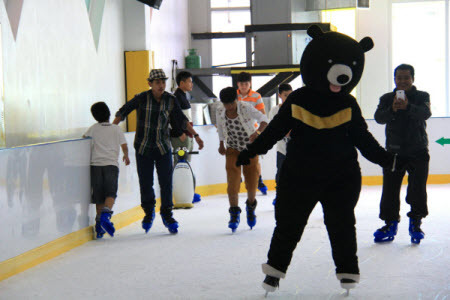 Kids City, a 10-storey entertainment centre for families in the Cambodian capital of Phnom Penh, was chosen as the site for a unique range of activities with the entire 2nd floor given over to Free the Bears to engage with visitors throughout the festival. Borrowing a sculpted penguin and Polar bear from the ice rink on the 8th floor we were able to create a dedicated Pole to Pole corner featuring Pole to Pole posters (including some specially created by local students from the International School of Phnom Penh), colouring sheets and fact sheets. Ipads were on hand with the Pole to Pole campaign website ready loaded, allowing visitors to learn more about the campaign themselves and to sign the petition (Did you sign the petition already?). Kids were guided in creating their own bookmarks, and could create ‘snowflake pledges’to hang on our (not so) Christmas tree. And of course, showing support for his snow-white cousins, Free the Bears’ mascot ‘Sunny bear’ was on hand throughout the festival, even taking to the ice rink at one time to help draw the crowds downstairs to our area! Overall the event was a great success, and hopefully will mark just the first of several events that the Free the Bears team will hold to increase awareness of the Pole to Pole campaign over the next year.